Joan Chiao and Katherine Blisinsky took a research on the worldwide spreading of the 5-HTTLPR – gene, which is identified as responsible for the mood (anxiety and mood disorder) of it`s carrier by transporting serotonin. It was published from the Royal Society Publishing. Using Hofstede`s model of cultural indices/dimensions to define cultures into individualistic and collectivistic, they crossed these data with the spreading of 5-HTTLPR. 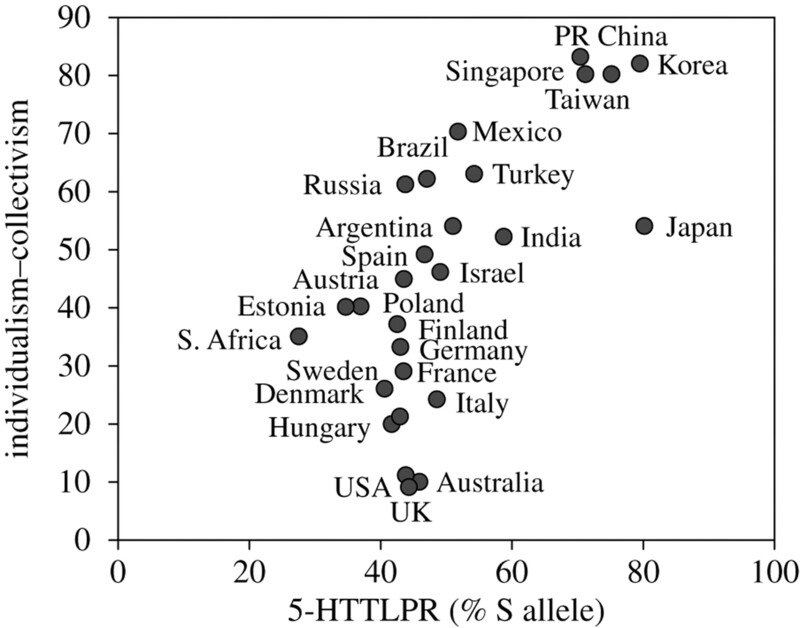 Results from correlation analysis between Hofstede’s individualism–collectivism index (reverse scored) and frequency of S allele carriers of the 5-HTTLPR across 29 nations. Collectivist nations showed higher prevalence of S allele carriers (r(29) = 0.70, p < 0.0001). Geographical coincidence between serotonin transporter gene diversity and cultural traits of individualism–collectivism across countries. Colour maps include all available published data for each variable of interest. Grey areas indicate geographical regions where no published data are available. (a ) Hofstede Colour map of frequency distribution of IND-COL from Hofstede (2001). (b) 5-HTTLPR Colour map of frequency distribution of S alleles of 5-HTTLPR. (c) anxiety Colour map of frequency of global prevalence of anxiety. (d) mood disorders Colour map of frequency of global prevalence of mood disorders. Yellow to red colour bar indicates low to high prevalence. Get the full article online here or download pdf here. It is packed with additional downloads. Hofstede`s Intercultural Tool is found here. This Map of Haplogroups (J.D. McDonald) shows the distribution of certain genetic characteristics. It is widely used for genealogical research because certain cell structures are inherited matrilinear or patrilinear. Click here to download from the the University of Illinois/School of Chemical Sciences. You can also download the full pdf here. Read a different view on the categories “Cultures and Genes” and “Culture influences Brain” or view the World’s Map of Happiness.